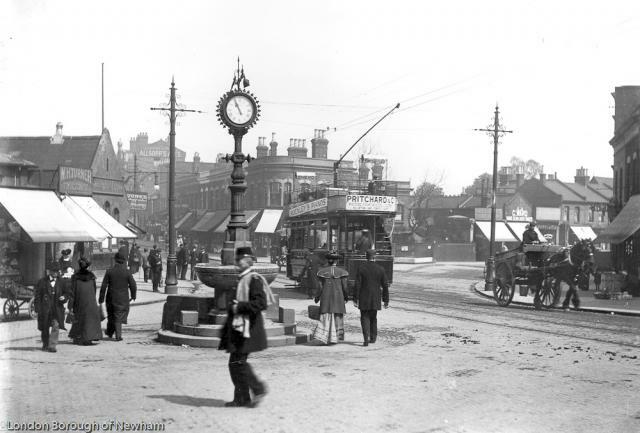 Although today Forest Gate is part of a bustling inner London borough, its origins lie in early Victorian times as a small clump of houses round a barrier to Epping Forest in what is now Woodford Road. The barrier was a gate designed to stop the cattle from the forest from straying onto the high road to Romford. It was not until the 1870s that the area to the south of Wanstead Flats become recognizably a London suburb. In 1812 Samuel Gurney, a well-known Quaker philanthropist, purchased the Ham House estate established by Dr. John Fothergill, who had lived there since 1762. During his tenancy the house and grounds were known throughout Europe as a botanical rival to Kew, with 3,400 species of tropical plants. The house remained a family residence until 1852. From the 1850s the estate, along with others owned by the Gurney family, was broken up and sold for property development. The western part of the estate became the West Ham and Jewish cemeteries and the Forest Gate Industrial School (later the Newham Maternity Hospital and now a housing estate and small park). The remainder became the Gurney housing estate, comprised of Hamfrith, Atherton, Norwich, Sprowston and Clova Roads, as well as Earlham Grove. The houses here were substantial and mainly occupied by middle class families. Smaller artisans dwellings were built in Odessa, Field and Tower Hamlets Roads. Shops began to appear in Woodgrange Road to serve these new developments. Development of the Woodgrange Park estate, the area between Manor Park cemetery and Woodgrange Road, also began in the 1850s. This area had originally been part of Woodgrange Farm and was sold to Thomas Corbett. He and his son Cameron, who later became the first Lord Rowallan, were responsible for the construction of the large villas that still characterize this estate. These were designed for, and sold to, city business men, doctors and professional people who employed servants. Development of the area to the south of Romford Road was also rapid, although the properties here were smaller and housed mainly clerical workers and skilled labourers. Upton Lane became a commercial focus as good quality shops opened to rival those in Woodgrange Road and service the local population. Good transport links helped to fuel the pace of development. The Eastern Counties Railway had opened its London to Romford Line in 1839 and a station was built at Forest Gate. However, it was not initially a success and actually closed down for two years from 1844. The London Tilbury and Southend Railway opened its line, which ran through Forest Gate, in 1858 and by the turn of the century things had certainly changed as over 350,000 passengers a month were using the station. Tramways opened along the Romford Road in 1886 and the Tottenham & Forest Gate Railway, built on a huge brick viaduct despite substantial local opposition, opened on 9 July,1894. It was a joint project between the Midland Railway and the London,Tilbury & Southend Railway, the Midland contributing by far the bulk of the capital. The line left the Midland and Great Eastern joint line at South Tottenham and ran via Walthamstow and Leyton to Barking. It joined the Forest Gate to Barking line at Woodgrange Park. The railway (which is now part of the London Overground Barking to Gospel Oak line) provided connections into Moorgate and St. Pancras and confirmed Forest Gate as a haven for City workers. Although the streets and villas of the area were an oasis of middle class, suburban tranquility for most of the year the Bank Holiday fairs on Wanstead Flats transformed the area into a temporary playground for east Londoners of all classes. A bandstand once stood next to the lake on the Flats across from Capel Road and although this has long gone its position is marked by the ring of trees circling its former site. With large numbers of people moving into the area there was a pressing need for churches and schools. In fact by 1903 there were more people attending Roman Catholic churches in the West Ham parish than in any other London borough. St. Angela’s Ursuline Convent was established in 1862 and the nuns ran two schools, St. Ursula’s and St. Angela’s. The Franciscans established St. Bonaventures School in 1875. The Emmanuel Church of England parish church was opened in 1852 and enlarged in 1889. In 1893 another congregation was established in Earlham Grove. Another church, St. Stephens, opened in 1887 and was erected as a memorial to the reformer Elizabeth Fry by evangelical churchmen. Industrial schools opened in Forest Lane and at St. Georges in the East. The Forest Lane School was the scene of a tragic accident in 1890 when 26 boys were killed in a fire. The Popular Union continued to run the building as a school until 1906, when it become a maternity hospital. In the 1990s the hospital site was re-developed for housing, but the façade of the main building was retained and remains a notable feature of the area. Plashet Park opened in 1891, the land having been bought from the Wood House Estate with assistance from the Corporation of the City of London, who also helped with the purchase of West Ham Park. The Corporation is also responsible for Wanstead Flats, Epping Forest and Wanstead Park. An Act of Parliament of 1878 established these areas as open spaces in perpetuity and charged the Corporation with their management. After the second world war West Ham Borough council wanted to build housing on the Flats but a well-organised local campaign put a stop to that. A number of famous people have lived in Forest Gate, including the actor and film director Bryan Forbes, actress Dame Anna Neagle, actor David Farrar, the inventor of antiseptic surgery Lord Lister and John Curwen, developer of the Tonic Sol-fa system of music made famous in The Sound of Music. More recently Forest Gate has been a place of settlement for new communities and each that has arrived has enriched the fabric of the area and the architecture as new churches, mosques, temples and Gurdwara have been built. there was a laundry on the lefthand side of sebert rd, going in from woodgrange road. it was a square building that sat back from the road,with room for parking a van. it later became a biscuit factory. I was born in tylney road 1938. my memory is still very sharp. we were in tylney road throughout the war. my grandfather owned the AH Simpkins Mineral water factory in1889 have you any info or photos? I was born in 13 Beauchamp road 20/07/1946 and went to St. Anthonys school. My 2x great-grandparents, Benjamin and Mary Ann Lipman lived at 32 Tylney Road as late as 1911. Benjamin died there in 1910 and Mary died in East Ham, at 81 Wellington Road. Is there a Forest Gate local history group or anything that might have pictures of them? All I know post-1911 is that one son moved to Cambridge (David) and one son lived in Ilford (Benjamin). Thanks for the interesting blog and posts. Does anyone know of a soldiers uniform factory in Hampton Rd in WW1? Hi, there were some small businesses on Balmoral Rd railway bridge, I only remember one did something with light bulbs, packing maybe. that was 1940’s. there were also a number of ‘factories’ at the manor park end of Hampton Rd, they backed onto the railway line.